Emotion has gotten in the way of facts. 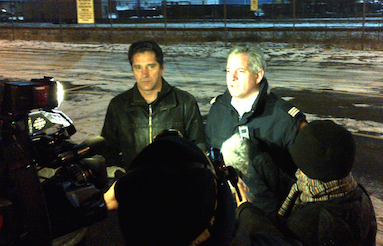 Phil McNulty (r) speaking to reporters last year. It’s been a week now since city council finally got around to debating Halifax Regional Fire and Emergency’s operational review of services. Several hours of discussion were spent flaying chief Doug Trussler’s substantial plans to close three urban fire stations and four volunteer substations. The firefighter union and the public have vocally opposed those plans. Trussler has maintained it’s the best possible distribution of resources. Keeping the stations open, he's argued, only provides a false sense of security. The decision was eventually deferred until next week, pending more information from Halifax Fire on the financial implications. 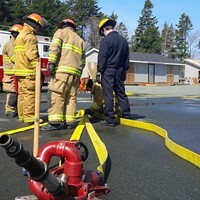 Since part of the problem for Halifax firefighters seems to be a lack of people, executive fire officer Phil McNulty took some time to explain to The Coast how one becomes a volunteer firefighter (you can read about that right here). Along the way, our discussion expanded into some of the issues facing fire service in Halifax, and the department’s disappointment with council’s actions last week. A condensed version of those interview portions is presented below, for your reading pleasure. Why are we lacking volunteer firefighters in Halifax? "It's an interesting evolution. Years ago, in the Bedford, Sackville, Cole Harbour areas, the firefighters only worked in the day. So the necessity to have volunteer firefighters cover off the evenings and the weekends was very important in order to provide that service. After amalgamation, all these fire services combined to create what we have today. We now provide 24-hour a day, seven days a week coverage to Bedford, Sackville, Cole Harbour, Eastern Passage. So, those volunteers in the core, what we call the [urban] core, they're augmenting a service that's there 24 hours a day, seven days a week. One could argue that they're not necessary. Money invested into those groups could be seen as money wasted. We don't see it that way, but we'd like to use those folks more effectively, if we could. That's why one of the things in the plan talked about rationalizing the core volunteers." How could the city get more volunteer firefighters? Can we loosen requirements? "See, that's it. We can't do that. Bill C-45 [Amendments to the Criminal Code Affecting the Criminal Liability of Organizations] came in after the Westray mining disaster. Basically that bill is there to ensure the safety of the workers, and to place the responsibility of worker safety not only on themselves but more importantly on the company, on management of the company. We have to protect our people from themselves, if you will. Years ago, it'd be like, 'Come on down to the hall. I see you drive a milk truck. You can drive a fire truck, right?' Not disrespecting those folks, but we don't have that luxury now. There are no people to select from, and we have an obligation to our people to ensure they're safe. We cannot put them in harm's way knowing that they don't have the training. It's catch-22." There didn’t seem to be any easy answers during last week’s meeting, except that it would help having more people. What can be done to attract more firefighters? "In those remote areas, the simple answer is there are no people. There are no people. It would be tough for you and I to leave our digs here in Halifax to go and live in Sheet Harbour to provide us an opportunity to volunteer. Which is why in that report we have asked for an additional five firefighters—career firefighters—to work out of Sheet Harbour. Now, we're introducing career staff into an area that's never had it before. The positive economic spinoff to that is, at the current rate of pay for five firefighters to work there, equates to a $505,000 commitment from the municipality. Those men and women who would get those jobs, they want to live in Sheet Harbour, Moser River, Tangier, Mushaboom. They don't want to live in the city. So they'll spend all of that money in the local economy. The young people in those areas will be able to look at them and say, 'There's a viable career opportunity for me here, in my community.' 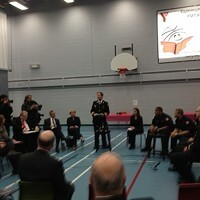 But more so, it's about public education and fire prevention. Our thought with these folks is they're going to visit every home and every business and develop fire escape routes, fire education plans to teach these folks how to fix their homes to become more fire safe. The goodwill that will be generated out of this will far exceed the small investment of the $505,000. It will also give us a guaranteed response, Monday to Friday, in that area. In the absence of having people to do that job for free, hiring people is in some cases the only way you can achieve that." Do we need more career firefighters right now, or volunteers? "Our plan suggested that with the addition of five career folks in Sheet Harbour—and with the closure of the core fire stations we talked about and the realigning of that staff, filling our current vacant positions—we have enough career firefighters in the core to provide that level of service that we're obligated to provide. If we need firefighters, they are in the rural and remote areas. "This is a very emotional topic. No one wants to hear the cost-benefit analysis of putting staff everywhere. The tax dollars would go through the roof. Arguably, you do a risk assessment. The provincial government, I'm not sure of the exact details, but the provincial government offers volunteer firefighters a $500 tax break. It's a minuscule amount of money that they give back to these volunteer firefighters. The HRM is lucky that we have a vibrant city with a healthy economy. What is it like in Meat Cove and Baddeck? Who's doing their fire service? True volunteers who get nothing but probably a turkey at Christmas. The provincial government doesn't give them the support they arguably have a responsibility to give. It's a very, very detailed problem and there's so many layers to it. It's really difficult to wrap your head around it. When elected officials allow emotion to get in the way of facts, then Tuesday happens." Were you disappointed then, in council’s decision? The motion’s still on the floor. They could still close those stations. "They could. We've been given clear direction from council right now to come back with a supplemental staff report that answers some specific questions. Most of them are 'How many firefighters do you need?' 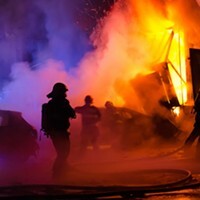 What's it going to cost to do what we were going to do, which was staff these much-needed aerials on both sides of the harbour, and to get our staffing to a safe level (which is four firefighters on every truck). If we keep those stations open and they want us to provide the level of service that we said we would and could provide if we could close those stations, we need 40 firefighters. That's what is currently housed in those three stations. Those were the bodies we would have had freed up to staff those aerials and raise the staffing levels in other communities to provide an enhanced service by eliminating redundant stations." Looking back to Halifax Fire’s presentation last week, did the councillors not fully understand what was being presented? "I'll say this; every councillor was provided an opportunity to sit down with the senior staff, to review things. Some councillors took advantage of that and spent hours with us, asked questions until they couldn't think of another question. We reviewed the document, we explained at great length. We really felt they had a clear understanding of where we were going." There were some vocal opponents to your plan, but some other councillors who very much supported it. "Reg Rankin stood up on three occasions and he spoke eloquently and intelligently on what he saw the issue to be. Then he had a dire warning for council, that you're moving into an area of operations. A line was crossed, from our perspective. Were we disappointed? Yeah, we were. We put a lot of work into that. We really believe that we can provide that service without those stations. Now, we provided those options for Council's considerations. If they choose to do that, that's fine. "To put it in layman's terms, it's like me painting my entire house and the boss saying 'I don't want that colour.' It would take 10 gallons of paint to paint the municipality. We've got seven. And we're trying to paint in the most crucial areas that need paint. That's what we're doing with our staff. That's what we're doing with our volunteer stations. We're trying to put them in the areas of greatest need based on risk." The fire chief wants volunteers in Dartmouth. Is he wrong? But Blair Cromwell won't be offered his job back.